Features: 100% Brand new and high quality! No white bottom, can stick on the wall of any color. Using removable glue, can repeat paste. Remove without leaving residue, don't worry about the wrong location. Posted can be pulled off, you can always change style. Can tear apart at any time, don't damage the wall, general paint walls, glass, any smooth surface can be posted. 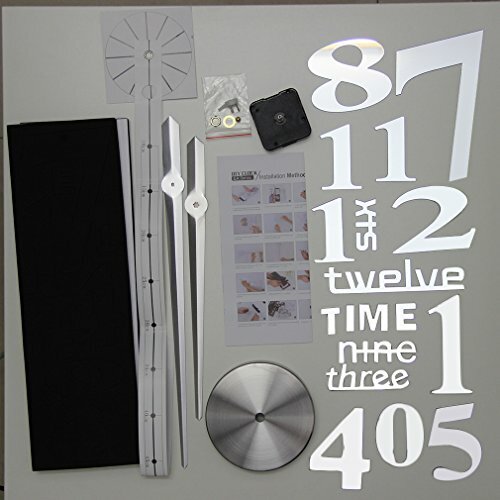 Specification: Material: EVA and metal Size: 120*120cm Pointer size: Minute: 39 cm, Hour: 31 cm Power: by 1 x AA battery(not include) Color:red, silver, blue, gold Package Include: 1 x Wall Sticker Clock Notes： Due to the difference between different monitors, the picture may not reflect the actual color of the item. We guarantee the style is the same as shown in the pictures. Thank you!